Sioux City, Iowa (CNN) - Mitt Romney boarded a charter airline quickly dubbed "Hair Force One" to fly to South Carolina Friday. His wife, Ann, told Romney the plane was named in honor of his famously coiffed mane. As Romney reached up to put his bag in an overhead bin, he noticed the press corps snapping his every moment with their iPhones. This is the first flight the campaign has organized with the press. "Look at the cameras," Romney laughed. "You guys get a life." His wife came to the back of the plane, which has ten rows, to meet the group of press, quibbling with one on his grade for Romney's debate performance from the night before. "It was his best performance," she told the reporter. 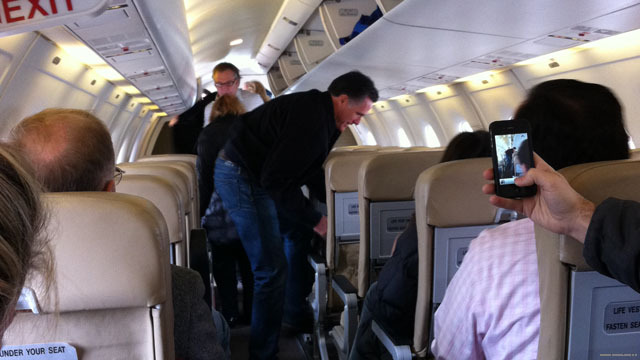 Accompanying his wife, Romney joked to a CBS reporter sitting in the emergency exit row: "You know how to use that row?" At an afternoon event in South Carolina, Romney will pick up the highly-coveted endorsement of the state's governor, Nikki Haley. Aptly named – he will never fly on Air Force One. "Hair Force One"... good one. I need to run out right now and copyright that name. Hope John Edwards hasn't beat me to the punch. Only in America will a politician of many faces like Romney can deceive the electorate like this! He seems to be a nice rich man, but he ain't no conservative!!! Romney is simply a desperate liberal! GOP answer to everything~"the middle class can pay for it, then blame the poor or a minority"
Another war mongering GOPT-bagger who never served jetting around the country picking up huge checks from the 1%ers and endorsements from the 1%er’s foot soldiers while spreading rumors and lies about our President. No better empty suite for that "duty". Romney would be a better president than we have right now, but would still not be optimum. It is looking like this election might be another choice of the "lesser of two evils." There have been entirely to many of those types of elections lately. Just wait for Cuomo 2016 or 2020, that's when we won't have to vote for the lesser of two evils. To a right wingnut, Romney would be a better president, but only if you take away his flip flopping, his complete lack of foreign policy understanding, his inability to create jobs, his wanting to start a war with Iran, his lying, his idea that corporations are people too, his catering to the upper .2% of wealthy Americans, his appeasement tendencies, and his support by the Kochs and Rove. Good maybe now he won't get into any more fights on comercial flights, remember LMFAO. Reason they want him to win but the Dems will shy away from these records(flip flopper). "Hair Force One" is about as close to Air Force One as Romney will ever get. That is unless Obama gives Mittens a ride as a consolation prize. Mirror, Mirror on the wall ... who's the fairest of them all? "I am, I am" ... Willard cries out before his great fall. He needs to hurry and get there. Promise to send more jobs to India for Nikki's aunts, uncles, cousins, friends, etc. He WILL either send them more jobs or bring more of them here to take the few American jobs that are remaining. Fortunately the opinions of liberals are unimportant right now as they would not vote for any republican anyway. Thus they can be ignored. I am certain that Donald Trump locked up that trademark LONG ago. You're right Bill. President Romney will rename it Air Force II. Romney is the only candidate who can help the economy and can clean up Washington. Obama and his team are so corrupt a good swift clense will do our country some good. Prepare for a recovery beginning in January of 2013!!! "Romney would be a better president than we have right now,"
The bar hasn't been set all that high. Maybe we should vote republican - as soon as he's been in office for two weeks we can blame him for the last 20 years, the high unemployement that bush started on day one in 2001, and for all the deficits. The baggers have given us the words to use. We can make sure it is the last republican ever nominated or anywhere near the whitehouse. OR - we can vote every republican out and take back this country for the people (instead of the corporations and $$$$). Lynda, I agree with your "Obama/Biden 2011" as this will be the last year Obama and Biden will enjoy together. Romney will end Obama's Depression as the recovery will start with Romeny taking over in 2013. Romeny 2012!! Yikes!!! Try to give our President a pat on the back, and here come the barkers, nipping at my heels. "as the recovery will start with Romeny taking over in 2013"
You mean the recovery that all the data shows already started under Obama? Remember: recovery doesnt' mean "suddenly all better like nothing ever happened." Oh, and remember also too: The GOP is screwed in a couple decades because of demographic shifts...just thought I'd keep pointing that out...tickles me pink to see you guys freak out about it. Those who are thinking Romney will be a President must think twice. He is not able to pass the nomination leave alone being president. No any real conservative will send Romney as their nominee. This is quite impossible. If I was him I could have saved time and money and leave the bid to someone else.